Buying gold this Akshaya Tritiya is advisable? Home » Gold » Buying gold this Akshaya Tritiya is advisable? Hindus believe in the theory of “mahurats, panchang, chogadiya” or auspicious timings in every step in life – be it to begin a new venture or marriage or making an important purchase. Akshaya Tritiya (Akha Teej) is auspicious days of the Hindu calendar. It is believed, any meaningful activity started on this day would be fruitful. 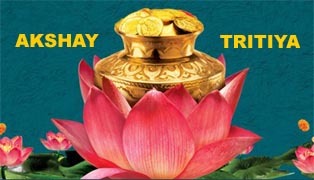 Akshaya Tritiya is the second biggest festival after Dhanteras for buying gold. It is believe that gold purchase on this day bring good fortune and never diminish. We have recently seen that gold price has shown correction up to 25000 Rs/- so do you really think that buying gold on this Akshaya Tritiya is worth decision? While tracking gold price movement we believe that recent crash in gold may not be temporary and it may continue. Probably it doesn’t make much sense to buy gold at current levels. Many Investor still believe that demand of gold and price of gold will increase due to wedding season and festival season. So Investor which usually times the market buys gold after this season and they avoid buying gold on occasions like Akshay Tritiya. If you are still want to buy gold on Akshay Tritiya than buy 1 gm gold as token of prosperity with religious reason. Gold price 20K again if? Gold price was at Rs. 20000/10 gm in Feb, 2011. But due to various local and global factor like economic slowdown, increase in dollar price, gold price has shoot up by Rs.32000/10 gm in Sept, 2012 almost 60% hike in 1.5 years. Currently if you see gold price is 27000/10 gm (in May, 2013) so almost 25% fall in just 8 months. This shows that gold price is highly unpredictable. One senior analyst of gold believes that we cannot rule out possibility of gold price falling below 20000/10 gm provided global economies give extremely good economic indicators, gold price fall by $1150 and rupee should rally to 52 Rs/- against dollar. Chance of such fall is very dim but if correction in gold price continues than Rs. 22000/10 gm to Rs.24000/10 gm range in gold is possible.